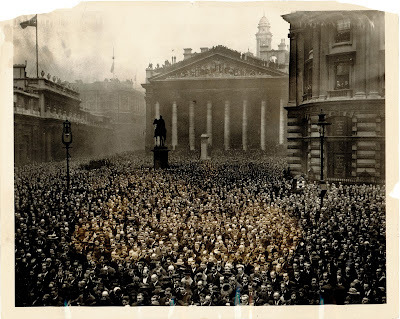 "Thousands of people standing in the heart of The City in London on Armistice Day, 1921. This was the most impressive scene in England. The vast crowd is in front of the Royal Exchange. To the left is the Bank of England. Most of the men in the crowd are bankers and insurance men." A few women are scattered throughout the crowd. This is a "general view of the bare-headed crowd during the two minutes of silence." Interesting photo. Will have to dig about a bit and learn more about how it was for the English. I was in England with a friend on November 11, 1996. At exactly 11:00 a.m., radios stopped broadcasting, cars pulled over and turned off their engines, and everyone and everything we could see stopped for two minutes to commemorate the losses the country suffered in World War I. I don't know if everything stops today, but I would not be surprised if it did.